A Frugal Christmas Present For Your Loved OnesEliminate The Muda! There are tons of ideas on the Internet today for frugal gifts. One of the more common ideas that seems to be popping up is personalized calendars. Yesterday, I saw no less than 4 tweets and 2 e-mails with recommendations of where you can have these made inexpensively. Maybe I am jumping on the bandwagon a little, but my wagon goes down a different path. The best price I have seen is $9.99 from Staples. With their service you upload your photos, arrange the layout, send the file and pick up your order in a day or two. Nearly 10 years ago this was how we began our annual tradition, although it was through Kinko’s and I recall it costing nearly $14 then. Still, at $10 each, it can add up quickly if you have a large family. After the first year we knew we wanted to do it again, but back in those days of debt reduction we were also determined to get it done cheaper. Below you will learn how our process has improved not only the cost but also the quality and content of our annual family calendars. We now print calendars for about $4 each. For the past several years we have done just about the entire process ourselves. While we have tried a couple different programs we have found 3 that make all the difference. Picasa – This is a free program created by our friends at Google. We use this program for managing all our digital photos but specific to our annual calendars we use it for only one purpose; red-eye reduction. It only takes one click and red-eye is gone! 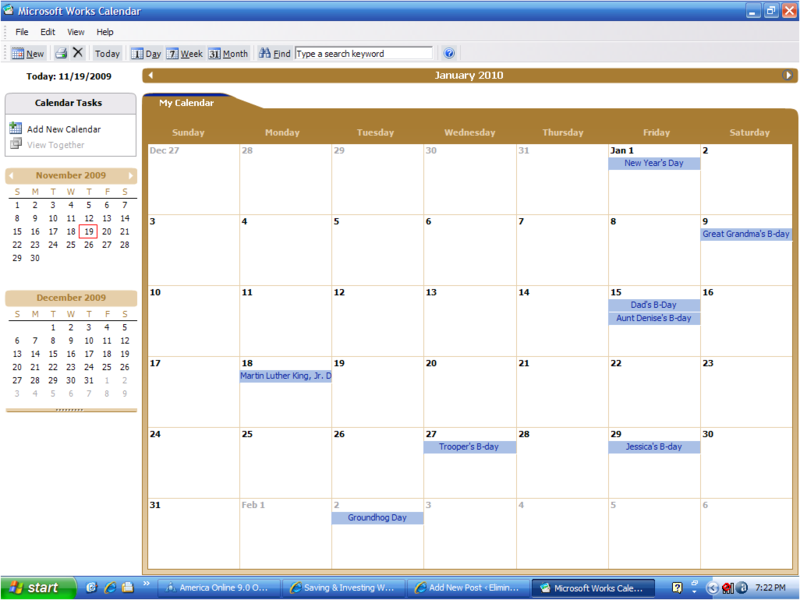 Microsoft Works Calendar – This program is loaded on many systems unless you opted for the MS Office. We like this particular program because it prints each month with a mini version of the previous and following month on the same page. 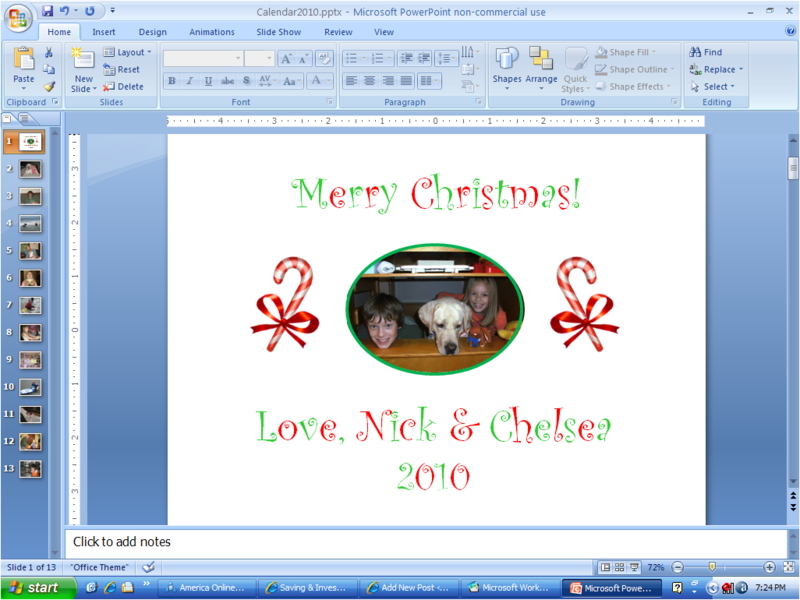 Microsoft PowerPoint – PowerPoint makes editing and printing the photos a snap. Step 1) Create the calendar – This is what sets our homemade calendars apart from the rest. We enter all the families’ special events, extended families birthdays, the grandparents anniversary and even the birthdays of our pets! 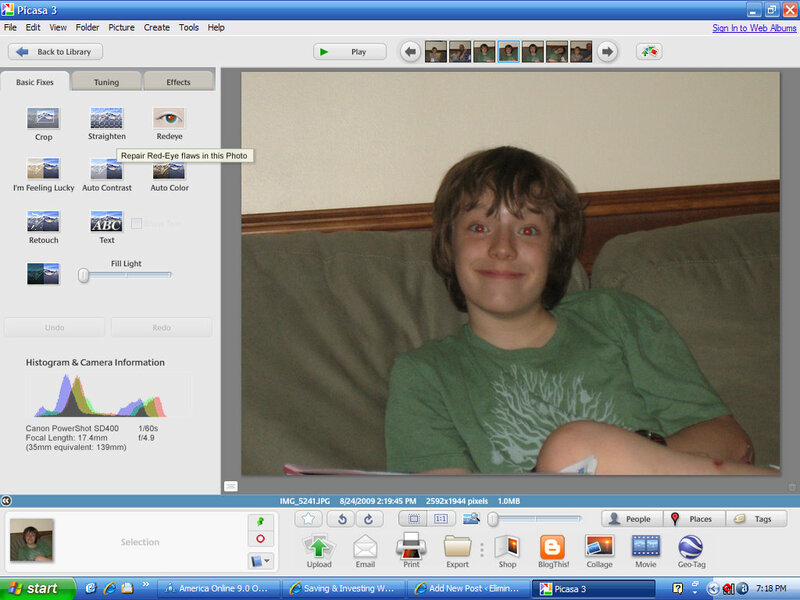 Step 2) Edit and arrange photos – After removing any red-eye with Picasa import the pictures into PowerPoint. In PowerPoint you can crop pictures easily and arrange them accordingly. Your photos should be sized to take up the entire slide. Doing so will still print in slide view with a narrow border around the outside. In PowerPoint you will also want to make a cover page (above). Have fun with these. We found the candy cane graphic on Microsoft.com; just search for clipart. The words are made with WordArt in PowerPoint. Step 3) Print all the photos first. We use 24lb. paper and high quality print setting. In the past our printer didn’t have great quality so we purchased paper and gained permission to use a printer at work. Step 4) Experiment with blank pages to figure out the proper orientation of the printer paper feed. I draw an arrow on the top page and watch how it comes out of the printer with a test print. Once you understand which side and the orientation, load the pictures one at a time and print each month accordingly on the back. Once you have all your pages printed out and collated you can take them to a Kinko’s/FedEx Office type of store. Last year the cost for binding with a transparent cover and cardstock back was less about $2.50 each. With all the customized and special dates your loved ones will love them.